I hope your week has been fantastic & you have already stopped by to check out the other awesome posts! Our gals are doing such an amazing job of providing all of us with inspiration, aren't they? My post this week will be a retirement card. My daughter needed one for a gal and she said most of the cards she found were the humorous variety & not suitable for a business to send. I decided to see what I could come up with & this is the result. I began with the beautiful Memory Box Delicate Butterfly Arch. To fill in the sides, I added 2 of the gorgeous Cheery Lynn Lace Corner Deco H dies. My sentiment was computer generated and cut with the smallest die from the Spellbinders Reflective Moment set. And finally, I added one of the beautiful Cheery Lynn Exotic Small Butterflies. The sentiment on this card could easily be changed to Happy Birthday, Get Well or just about anything else which makes it even more versatile. I hope this has given you some ideas! If you stop by the Dies R Us store, you will get even more! We now carry over 30 different brands of dies and are adding more all the time. Check us out! We also have incredible shipping rates!! Don't forget to join the fun on our challenge blogs too! See you next Wednesday! Have a terrific week! Oh Sherri, this is beautiful! 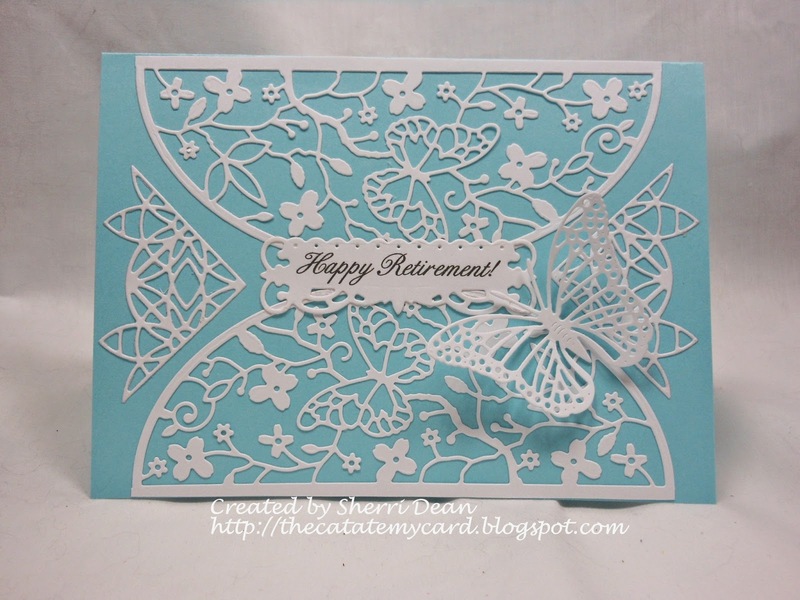 I love the new Memory Box Arch and it makes an incredible card that can be used for many different occasions. Love the pretty blue back ground and the butterfly is the perfect accompaniment.LOVE LOVE LOVE!!!! The Delicate Butterfly Arch is on my list! Beautiful card Sherri! love the delicateness of this.